‘돌실나이’는 전남 곡성군 석곡면에서 삼베를 짜는 일(길쌈) 또는 그러한 기술을 가진 사람을 말한다. 삼베는 ‘베’라고도 불리며, 한자어로는 마·마포·포 라고도 한다. 곡성의 돌실나이는 예로부터 품질이 우수하고 섬세하여 삼베의 대명사로 불리웠다. 삼베는 전기 신석기시대의 유적인 궁산조개더미에서 뼈로 만든 바늘에 실이 감겨 있는 것이 출토된 것으로 보아 그 이전부터 사용하였음을 알 수 있다. 고려시대에는 기술이 발달하여 중국으로 수출하였고, 문물교환의 수단으로 모시와 함께 사용되기도 하였다. 조선시대에는 면의 재배로 삼베의 생산이 약간 줄어들었다. 삼베의 제작과정을 보면 우선 재배를 해서 수확을 한 후, 잎을 훑은 삼단을 삼굿에 넣고 쪄서 껍질을 벗기고 햇볕에 말린다. 삼을 쪼개는 과정을 거친후, 실을 한올 한올 길게 잇는다. 그런 다음 베 한 필의 길이와 삼베에 따라 몇 올이 들어갈지 결정한다. 마지막으로 풀 먹이는 과정을 거친 다음 베틀을 이용해 베를 짠다. 오늘날 삼베의 폭은 30∼35㎝ 정도로 돌실나이가 9승, 안동포가 12승이 짜지고 있으며, 숫자가 높을수록 섬세한 포가 된다. 예전에는 북포(함경도 육진), 강포(강원도), 영포(경상도), 안동포(경북 안동)가 유명하였으나 서양문물의 유입에 따라 가내수공업으로 전락하면서 겨우 명맥만 유지하고 있는 실정이다. 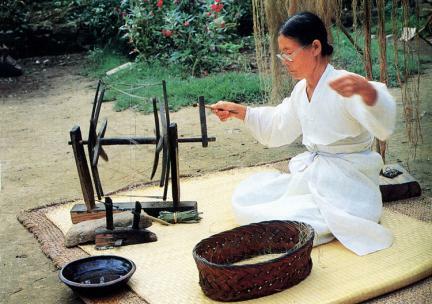 Gokseong Dolsillai refers to the work of hemp weaving or women hemp weavers in Seokgok-myeon, Gokseong-gun, Jeollanam-do. 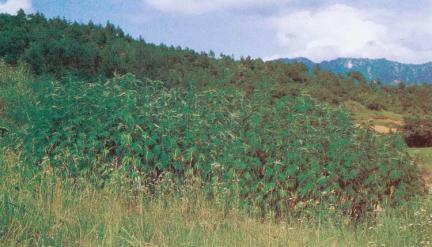 The hemp cloth made in Gokseong has been known for its high quality and exquisiteness. The thread wound over an animal bone-made needle unearthed from a shell mound in Gungsan, Yonggang, Pyeongannam-do -- which is a site of the early Neolithic Period -- makes us assume that hemp cloth was used during that period. 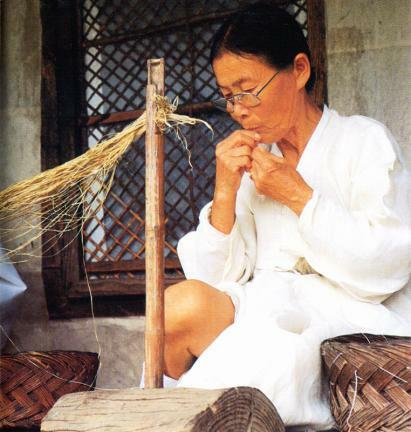 Korea’s hemp cloth technology was developed well during the Goryeo Period (877-1394), and the country exported goods to China. 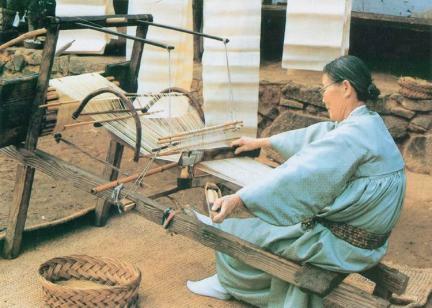 Hemp cloth, along with ramie cloth, was used as a means of exchange. 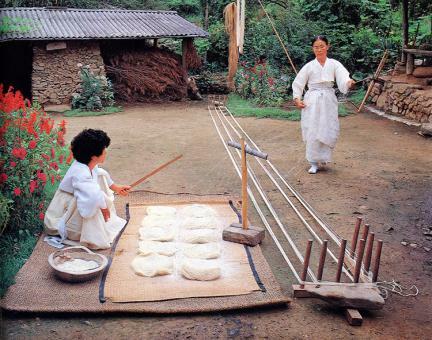 By the Joseon Period (1392-1910), hemp cloth production decreased due to the growing of cotton. As for the hemp cloth production process, the harvested hemp stalks are steamed, with the leaves removed and the skins peeled off. 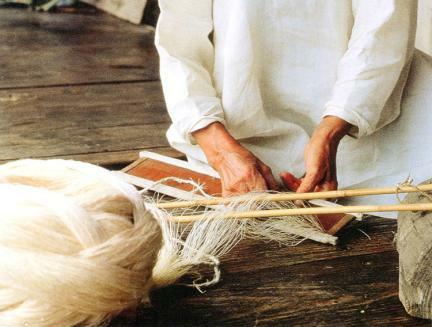 After the process of drying and splitting, strands of thread are linked with each other. A decision is made on how many strands are to be put into a given space. 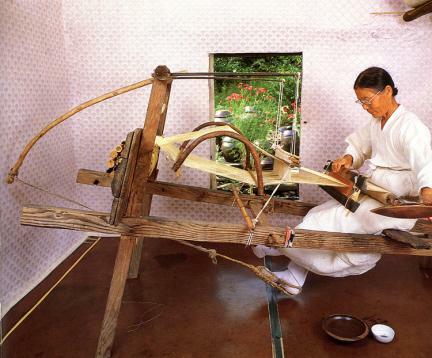 The threads are starched, and then hemp is woven with a weaving machine. 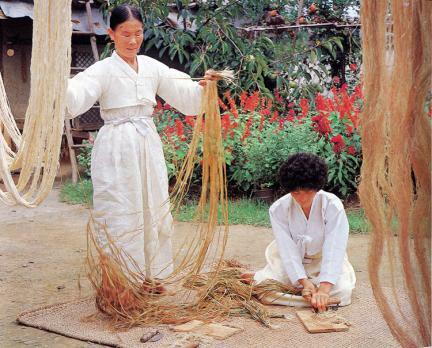 The hemp cloth made in Gokseong and Andong has 9 and 12 warp threads, respectively, in a space 30-35cm wide. A higher figure of warp threads means higher-quality product. In the past, those made in Yukjin of Hamgyeong-do (“Bukpo”), Gangwon-do (“Gangpo”), Gyeongsang-do (“Yeongpo”), and Andong (“Andongpo”) were well known. Now, they have been pushed aside by the introduction of machine-woven cloth.